An ideal tile for a kitchen backsplash or bathroom surfaces, the glass combination of Splashback Tile Capriccio Scafati Glass Tile creates a beautifully multi-dimensionally effect. The mesh backing not only simplifies installation, it also allows the tiles to be separated which adds to their design flexibility. Sample size tiles available. See item 204278944 for sample size tile. 1 square foot per piece, each piece sold individually. Piece weight equals 0.75 lbs. Buy online Splashback Tile Capriccio Scafati 12 in. x 12 in. 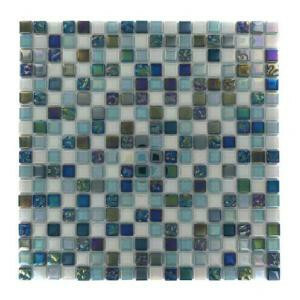 x 8 mm Glass Mosaic Floor and Wall Tile CAPRICCIO SCAFATI GLASS TILE, leave review and share Your friends.